Prepare yourself for a recap of the last day and half, complete with a crazy amount of pictures. 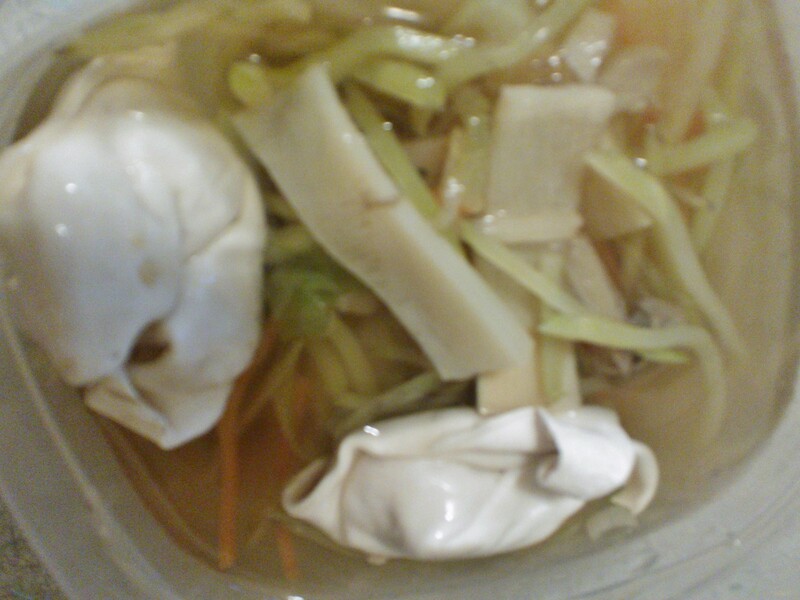 Wednesday night, I ate some homemade wonton soup I found in the freezer. Yum! 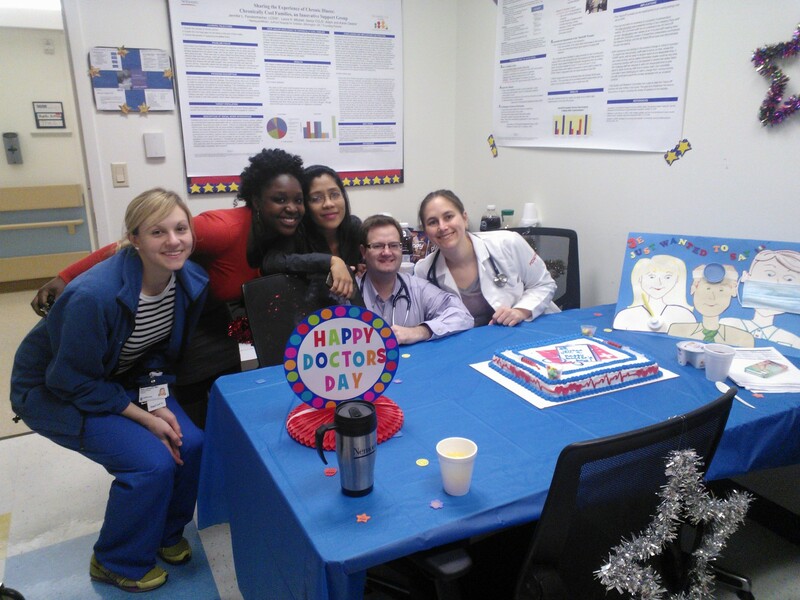 It was an easy shift since I was placed in a 1:1. Although I did not have any school stuff with me to pass the time, I spent my night researching downtown San Jose and eateries to better prepare myself for next week’s trip. I found a variety of places including Indian, sushi and vegan! Arriving home, I made a cup of decaf tea and sleepily waited for my uncle to drop of some much anticipated cookies. Ever since my grandmother passed away, he has turned into “Barry Crocker.” His specialty is ricotta cookies. I love his ricotta cookies! The texture is so unique! He typically makes Lemon Ricotta Cookies that I devour every time! I mean, these cookies go fast! Everyone wants them! 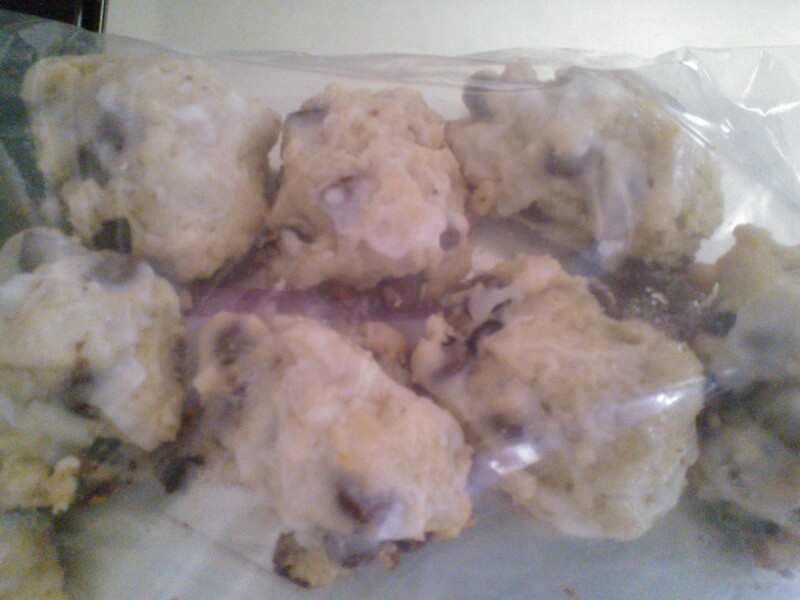 He called me and said he would drop off his latest creation: Chocolate Chip Ricotta Cookies! They looked like chocolate chip scones, but wow! They had the same texture as before, but no with a chocolate treat. One word: Addicting! I’ll talk to him and see if he’ll share his secrets with us! I spent the remainder of my afternoon taking a brisk walk to the supermarket for some few essentials for the weekend, then tidying up the house, and doing a bit of ab work. 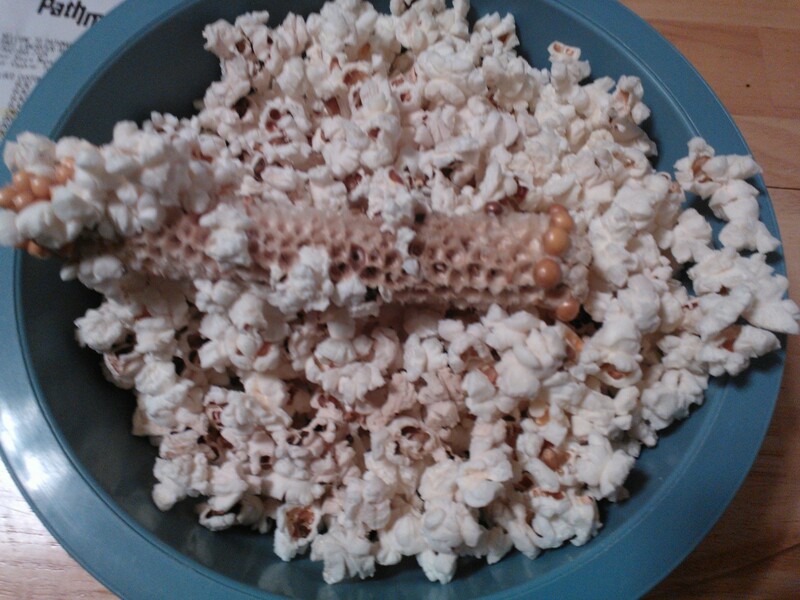 Before I left the house, mom really wanted to make some popcorn. Last year, when I was in Nashville, TN for the International Convention, I picked this up. I though the novelty of it was too cool! 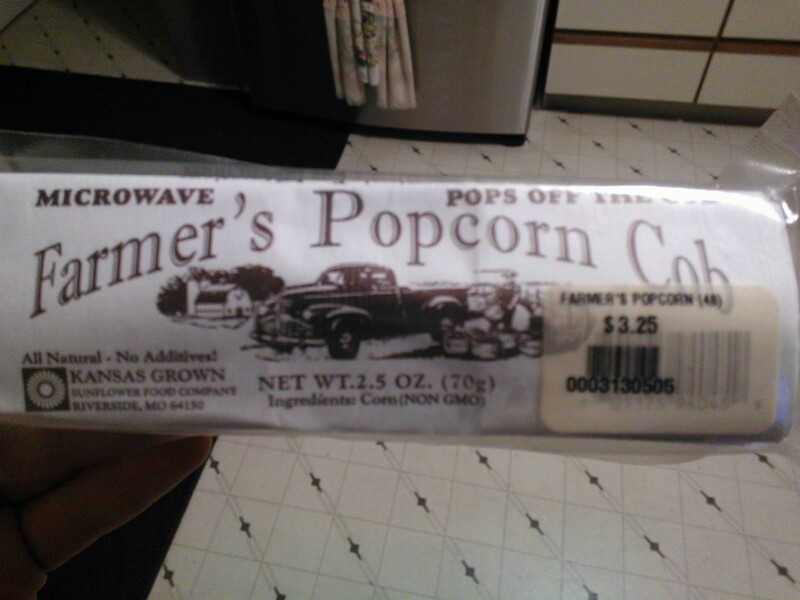 Its a cob of corn… to make popcorn! You just slide this, what looks like Halloween corn, into the provided bag, fold the bags edge closed, and pop away! 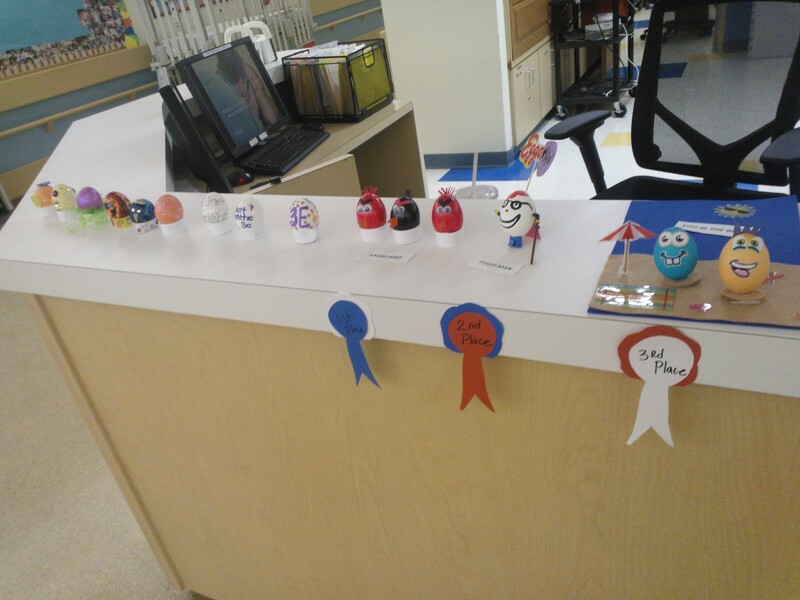 I forgot we had an egg decorating contest to help raise money for the asthma foundation. 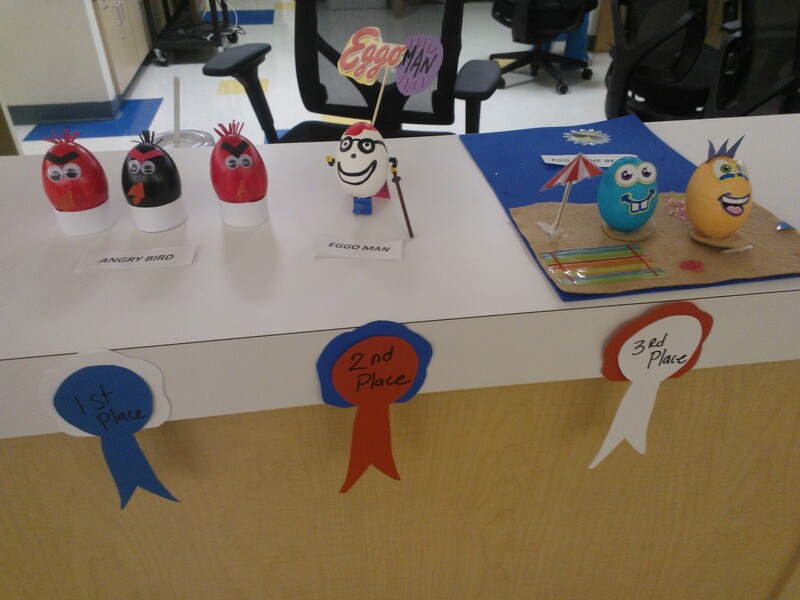 In first place, was Angry Birds. I had one of the best night shift meals in a while! I told you that falafel dip was going to be a Bundo house staple, and I meant it. 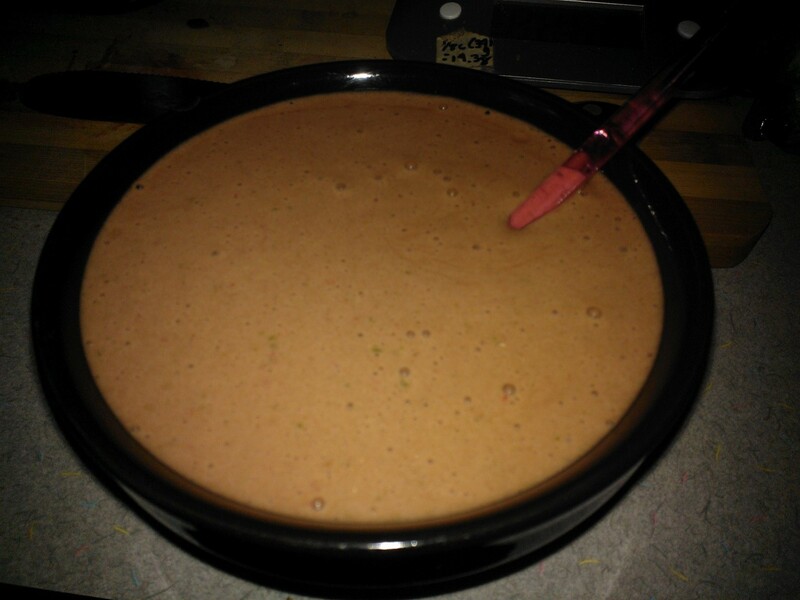 I mixed the remaining dip left over from the falafel with some tuna fish. 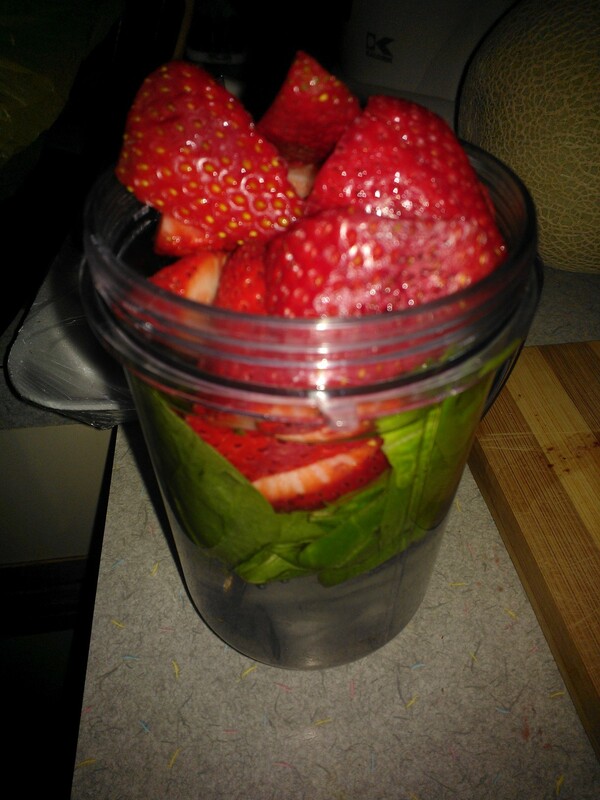 I laid this on a bed of spinach, along with tomato and onion and wrapped in an Everything tortilla! At work, I lucked out and found some roasted red peppers on the salad bar and threw those on there, too! To join the party… some celery and carrot sticks with reduced fat Ranch dressing and a fresh and crunchy bean salad, also from the salad bar. Dessert was a Fiber One brownie! It figures that the one day I mess up on eating meat, it would be the morning of Good Friday! Ugh! My girlfriend and I split some chicken fingers! I haven’t eaten them in ages! 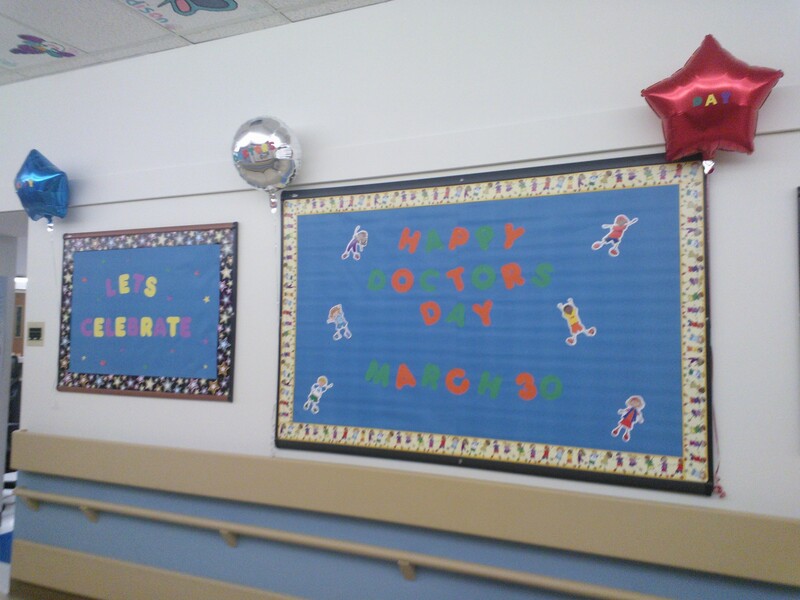 During this shift we also decorated for our unit’s Doctor’s Day. 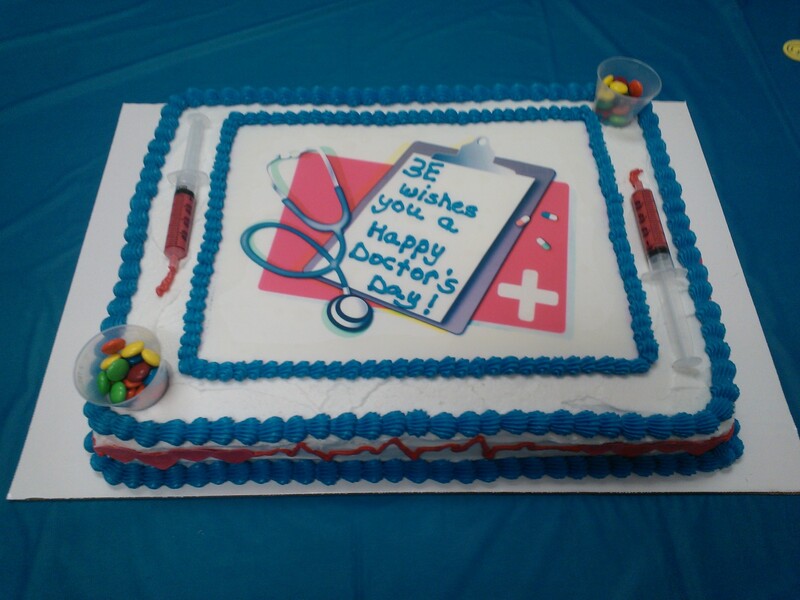 Our night shift crew prepared everything for breakfast while today;s day shift staff will set up lunch. 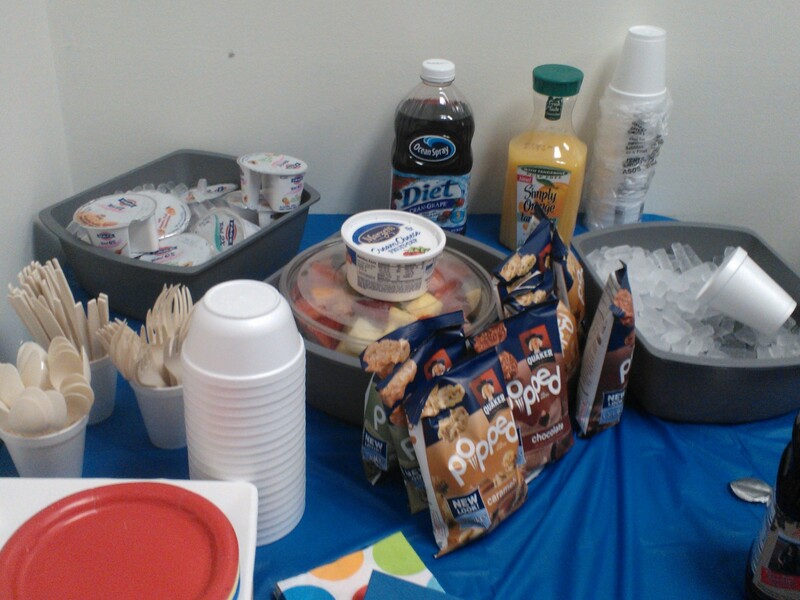 We had bags of Quaker Quakes, Fage yogurt, coffee, fruit… etc. I headed home in fun because I ate a bit more than I had wanted. After chatting with mom for about an hour, I started to feel a hungry stomach (which kind of cheered me up slightly knowing that I recognized what my body wanted). Before heading to bed, I pulled out OIKOS Pomegranate Greek yogurt and topped it with chia. MMMM I forgot how much I liked this one! 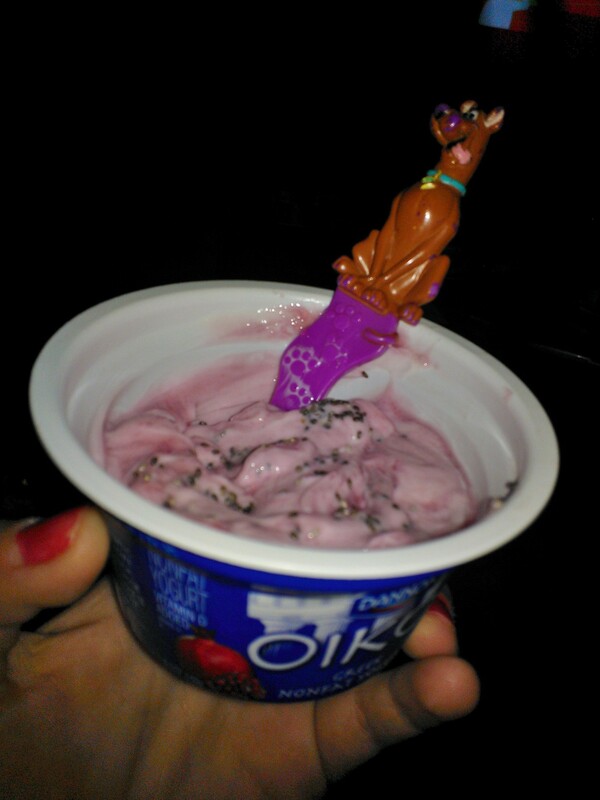 (And my Scooby Doo spoon from the bottom of the Rice Krispies box, to embrace some childhood). I was able to get about 2 hours of sleep before I woke up. I guess I turned off the alarm I had set for Church, but I still woke up on time. I guess the Big Guy really wanted me there! 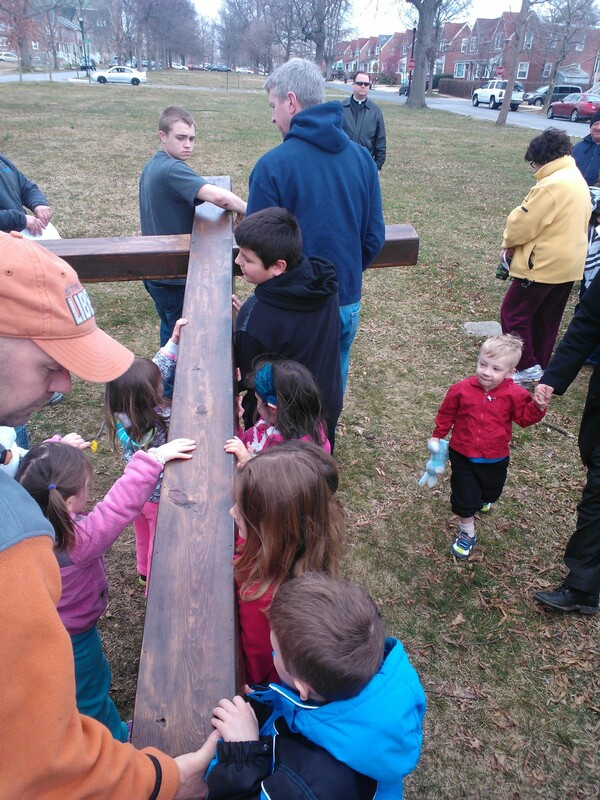 This is something I look forward to every Good Friday. 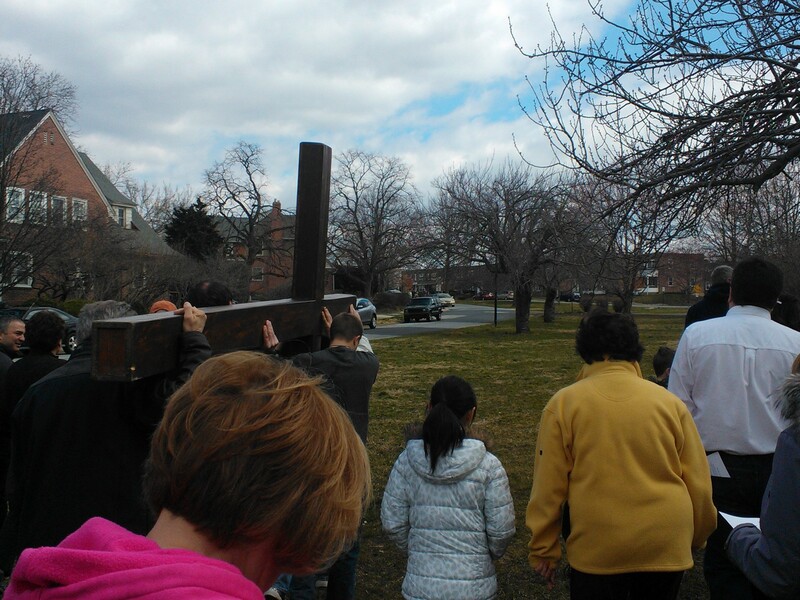 (Today is Good Friday, by the way… the day Christ die on the cross.) 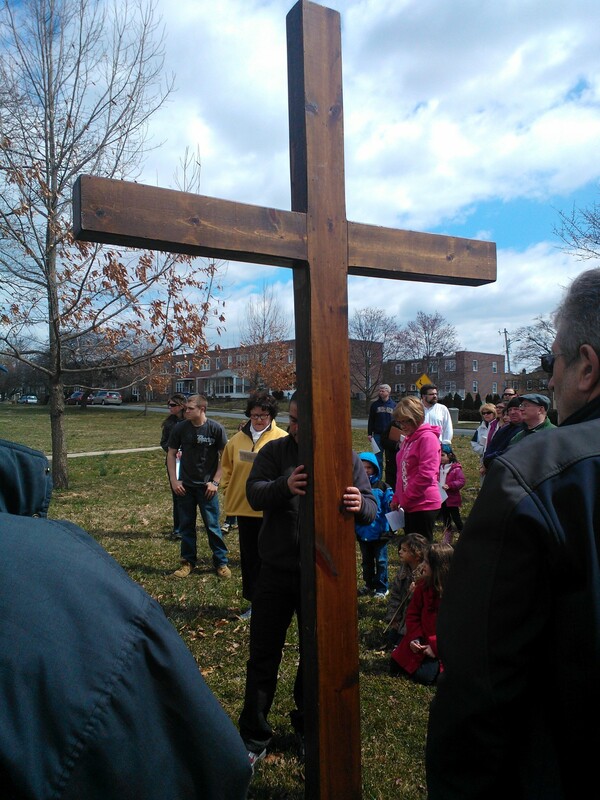 Every Friday during Lent we celebrate what is known to Catholics as the Stations of the Cross, marking key points leading up the the crucifiction. 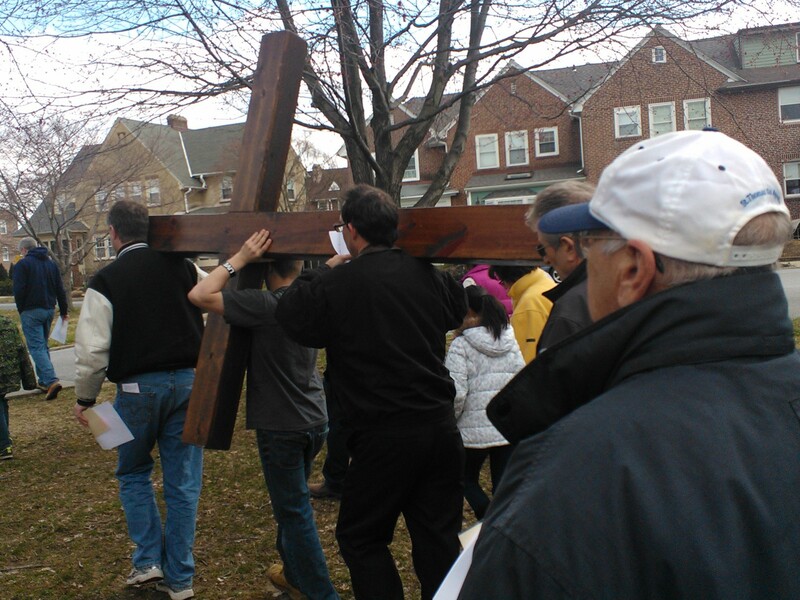 On Good Friday, the congregation meets a few blocks away and processes towards Church with a large wooden cross. 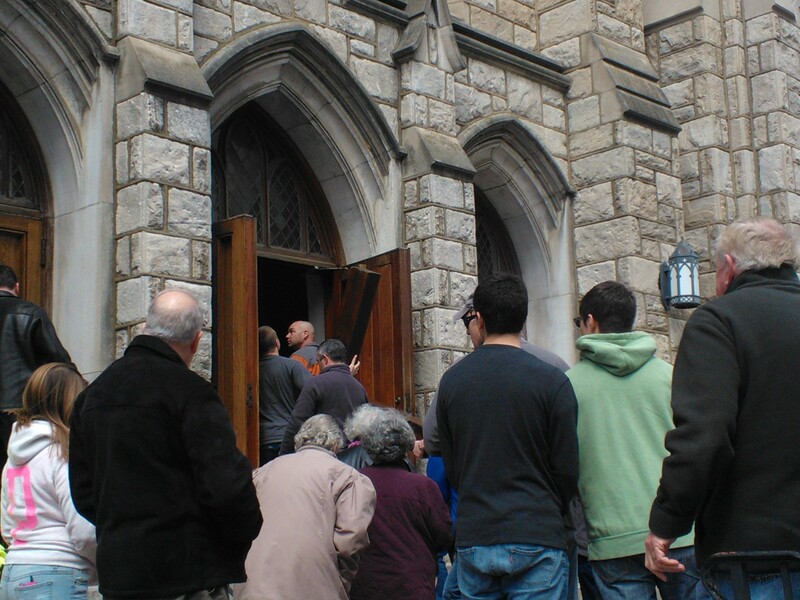 We pause at intervals to read the stations, and as we process we sing hymns. I love the unifying feeling of this event and the fact that we take time to reflect on our lives, faith, each other, and our blessings. I am a lector at my Church as read a station every year. This year, I also acted as song leader, leading the congregation in the hymns between stations. 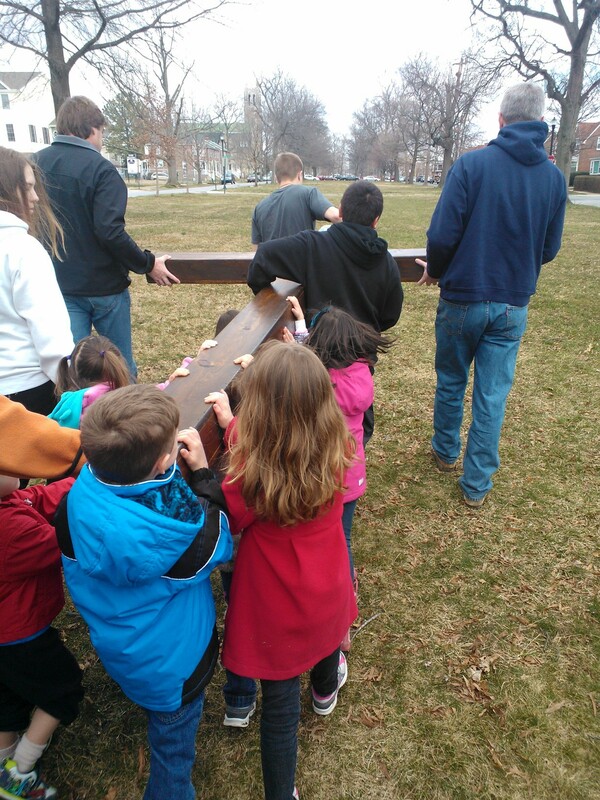 I wanted to be more involved this year, and I helped carry the cross in between two stations. 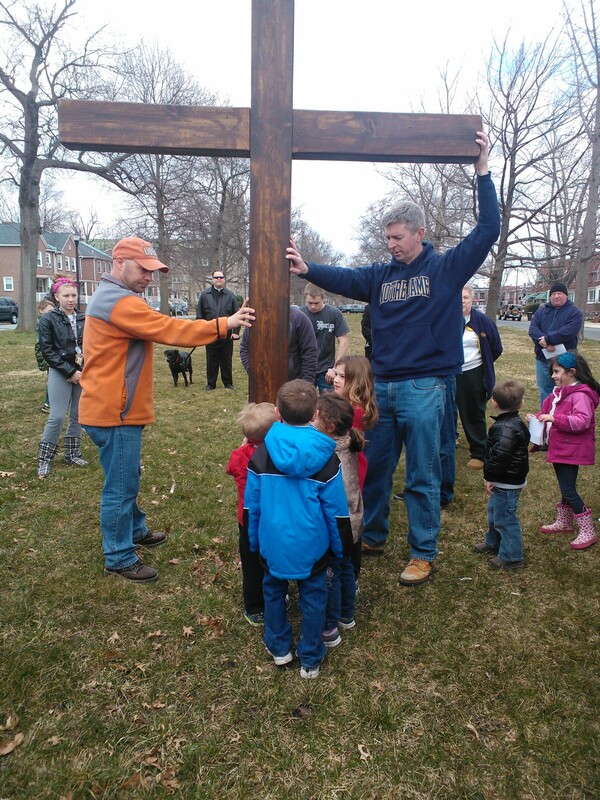 I had three favorite parts about today’s procession: 1) all the new faces, 2) it was my mom’s first time attending, and 3)even the little kids got involved this year! 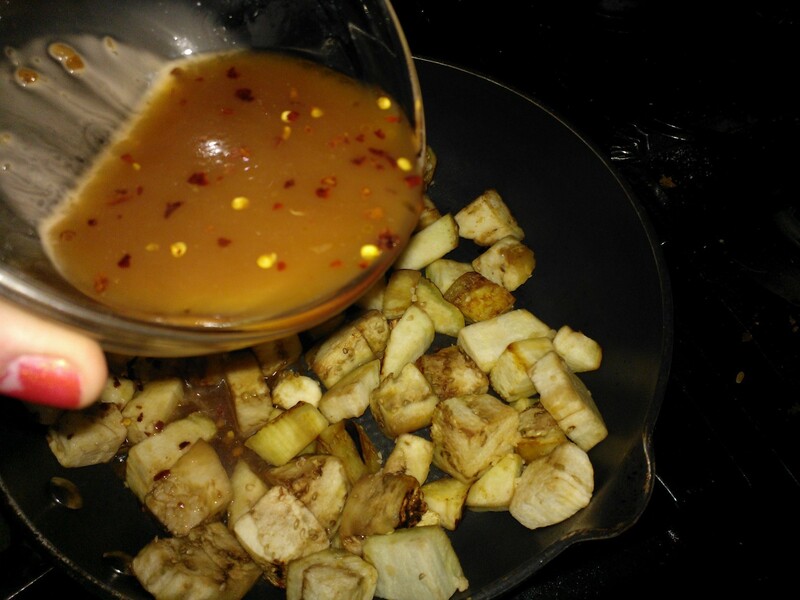 Afterwards, I whipped up a new recipe that I guarantee you will see again on this blog! My mom and I love eggplant. I eat mine in any way but fried, and my mom ONLY eats hers fried, therefore, I am always looking for healthy eggplant recipes to snag my mom from the dark side. I used Hungry Girl’s recipe for an eggplant stir-fry and let me tell ya, I was impressed! I find with some of her recipes, that theres a potential for bland-ness or that I need to acquire the taste, but not with this one! And an added bonus what how absolutely easy it was! 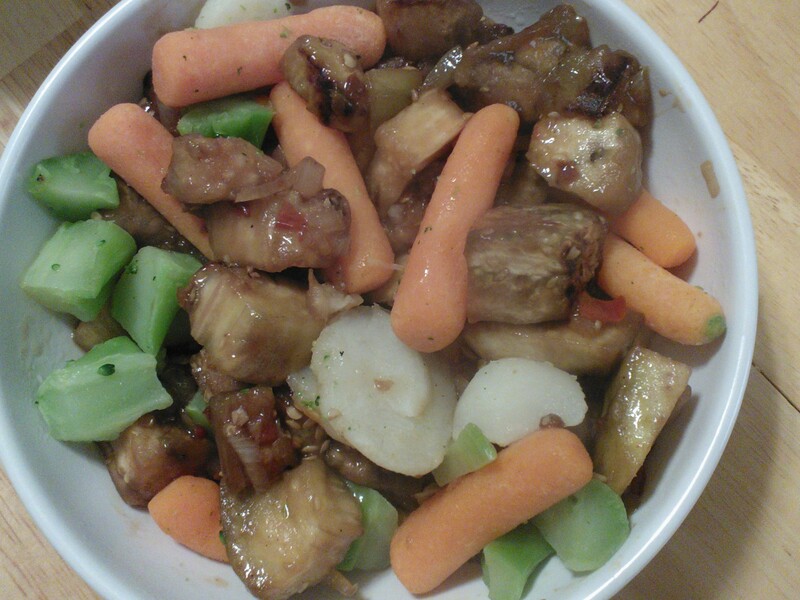 To top it off and add some different textures, I steamed up some frozen stir-fry vegetables. I can’t wait to try this with tofu! I’ve had a decent amount of requests from readers about tofu recipes, so this is a contender. MMMM! It was everything you’d expect! Sweet and sticky and just a little kick! 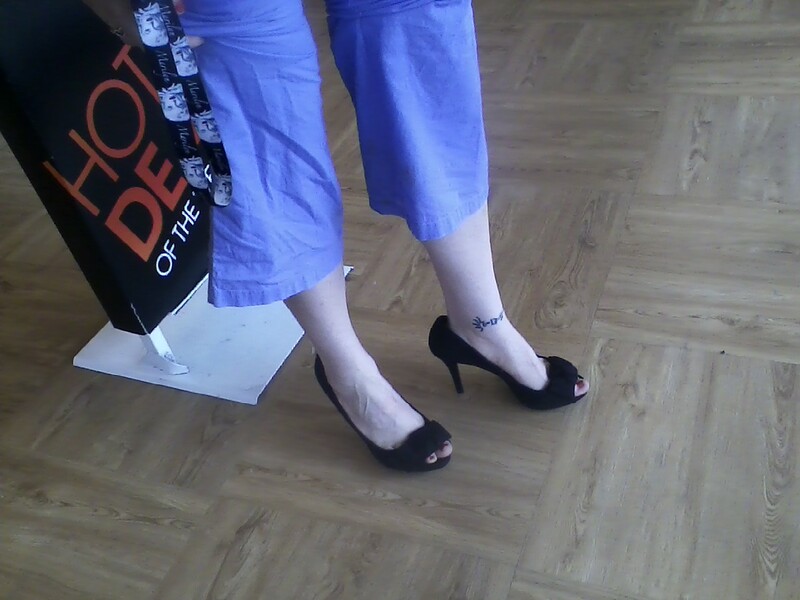 I had gotten a coupon for Payless Shoes for 20% off my purchase and since I’m going to be hitting California soon, I thought I could use a nice pair of black staple pumps. 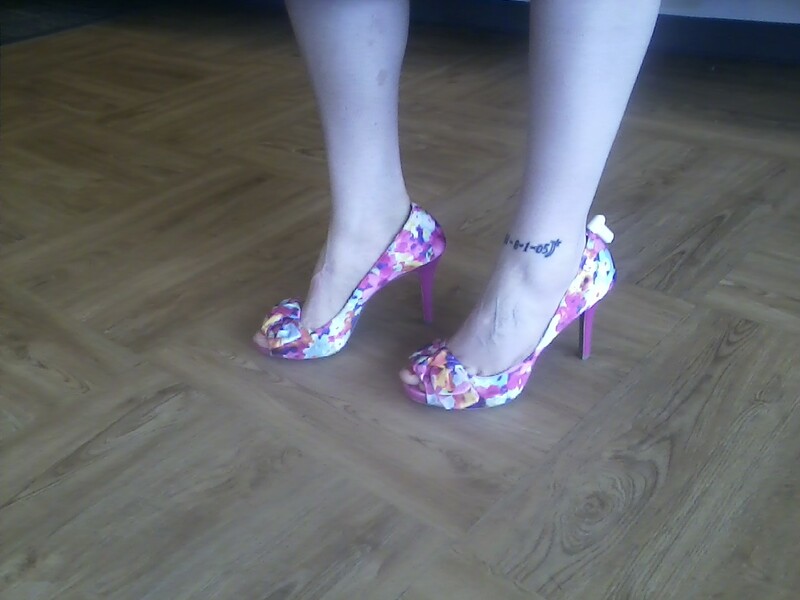 After playing around with some shoe indulgence and a fashion shoe (haha puns! 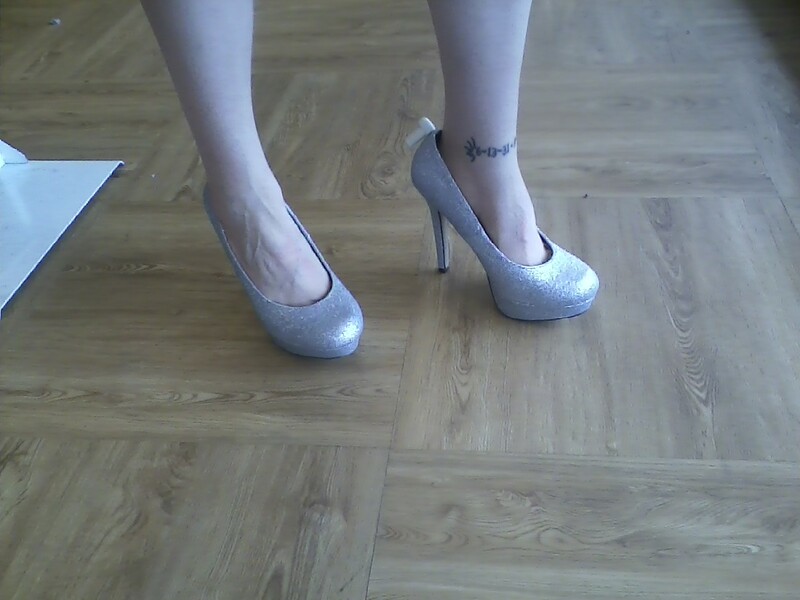 ), I decided on a comfy pair of peep-toes.